The GROW model is used by coaches to enable individuals to reach their objectives. As you will see while reading about this model, there’s a large overlap with the skills already used by UX designers. As a designer, it can be helpful for you to see the parallels between the two professions – as it allows you to add an extra string to your bow without too much additional effort. UX is a cyclical process. It begins with identifying the needs of the users, through in-context observation and analysis of the users’ realities and pain points, then we prototype our designs in minimal viable solutions, so that we can test them and collect user feedback to be able to iterate and start the cycle all over again. UX is designed to help us create the perfect products. The GROW model is also cyclical. 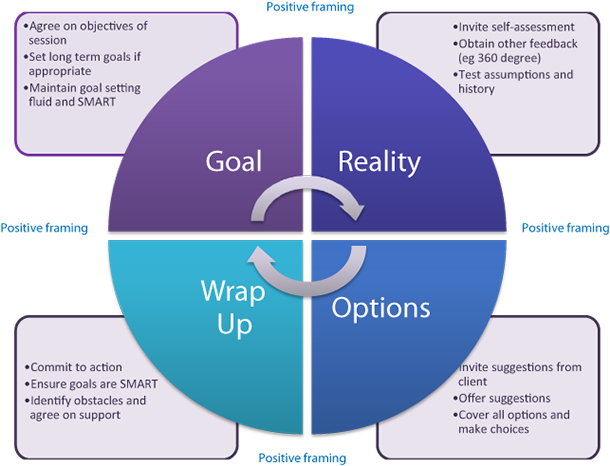 It beings with goal setting, then we examine the reality of the current situation, then we check out our options, then we wrap up and use feedback before iterating the cycle (if needed). Coaching works to help people address specific problems. You begin a GROW model coaching intervention by clearly defining what output is sought by the coaching client. That might be “I want to get promoted at work” or “I want to be able to manage my team more effectively”. This is in the same way that you identify the need at the heart of human-centred (or user-centred) design. You can’t reach an objective without stating it clearly. The solutions take to get there may vary depending on the individual but it’s important to know where they want to be before looking for solutions. The next phase in coaching is to determine the reality of the situation. Where is the individual now? What are the obstacles to them achieving what they want to achieve? What are the skills gaps? Do they really want to get there at all? Just as with UX design, it’s entirely possible for a coaching client to say “I want XYZ” but in reality it may not be all that important to them. Checking the reality as you would when you observe and analyse users; helps put the goal into perspective as well as starting to shape the options for reaching that goal. The third phase of the GROW coaching model involves outlining options that bridge the gap between the current reality and the goal. It’s important for a coach to help the client examine these options in their own light. The coaching client will need to select an option to solve their immediate needs and this can vary from client to client. So for example; the client wants to be promoted. It’s noted that the biggest obstacle to this is that they lack a specific skill. Their options might be to take a course (online or offline) or to self-teach (via books or other reading materials) or to seek development in the workplace (through observing someone else doing a similar role). It’s up to the client to choose the right option for them. There are no bad choices as long as the action chose is one that the client can commit to and has the resources to achieve (e.g. time, money, support, etc.). This isn’t an official part of the GROW model but in practice, once a client decides on a solution – they have to put that solution into action. In a similar way in a UX project the action is the creation of a prototype (or possibly depending on the iteration level within the cycle – a working product). 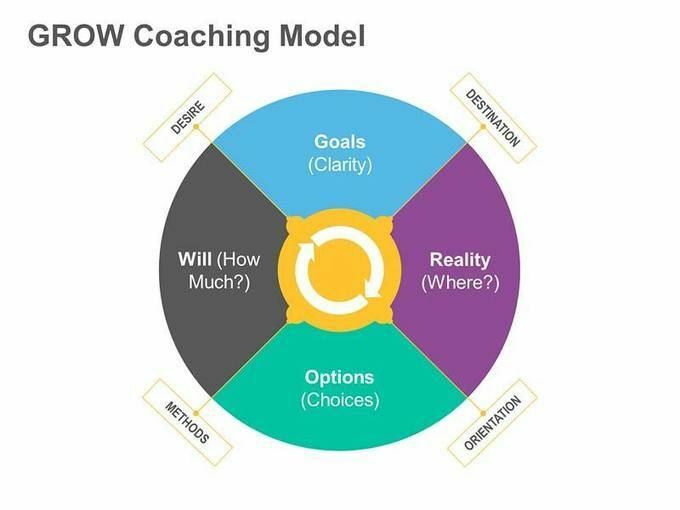 In the final phase of the GROW model the coaching client examines, with their coach, the effectiveness of their choices. Has the objective been reached? Are they satisfied now that they have achieved their objective? If it wasn’t reached, what prevented that? Is there something else that they intend to do instead? This corresponds with the user feedback of the UX cycle. It’s where the actions taken are reviewed and this allows for further iteration of the product. Similarly, the coaching client’s wrap up and feedback enables the further iteration of their own personal development. One of the reasons that UX designers can make for incredible professional coaches is that the UX design model and the coaching model are very similar. In addition, the skills required for each profession are compatible too. UX designers will need to be able to ask questions and uncover answers as they conduct research to develop their products; coaches have to be able to ask questions and uncover answers as they seek to help their clients develop themselves. Coaching is a valuable skill, not just in the workplace but throughout life. Managers, parents, colleagues, etc. all require the ability to coach to fulfil their roles more effectively. UX designers might want to consider training as professional coaches to enhance their efficiency at work and to increase their own career prospects.